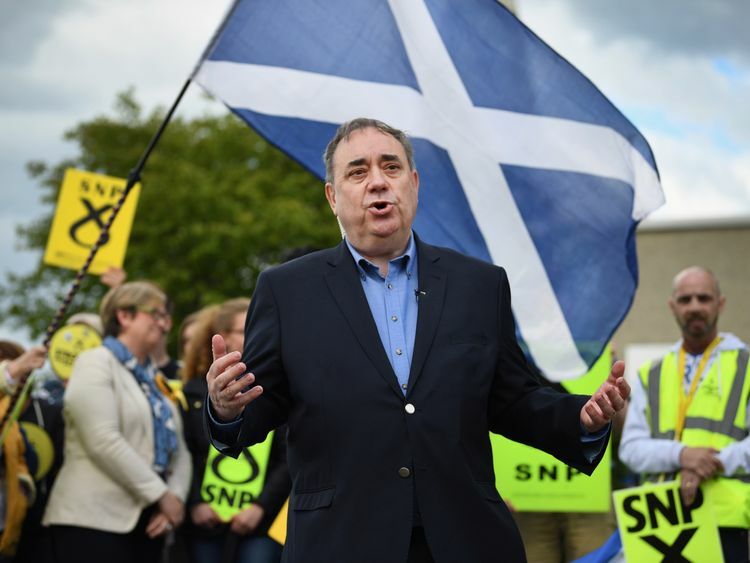 Former Scottish First Minister Alex Salmond has promised that if he becomes chairman of Johnston Press he will champion the editorial independence of its newspapers. The one-time SNP leader told Sky News Ian King Live: "I don't think that quality newspapers should back individual political parties. "They should champion causes and ideas of course, but not individual political parties. "The newspaper group, whose flagship title is The Scotsman, has agreed to a shareholder vote on the removal of two of its most senior directors.Venture capitalist Christen Ager-Hanssen, who owns 20% of the company, wants to install Mr Salmond as its new chairman.The Edinburgh-based newspaper championed the campaign for a Scottish Parliament, but backed a 'no' vote in the 2014 independence referendum.Meanwhile, successive rounds of cutbacks have prompted concerns about the quality of its journalism. Johnston Press, which also owns some 200 local newspapers including the Yorkshire Post and the national title the i, has seen its market value shrink from €1.6bn in 2005 to €15m.This month it reported a 7% decline in third-quarter revenues compared with the same time last year.Mr Agger-Hanssen and Mr Salmond believe that if their boardroom coup is successful they can make more money from digital advertising and have promised to invest in journalism.Mr Salmond said: "If the shareholders back us, then Johnston Press will be taken in a new, exciting and positive direction, but if they don't then the current senior management will continue in their disastrous course of policy. "However, Frank O'Donnell, who became editor of The Scotsman in April, says the former Scottish First Minister's comments that his title has become irrelevant are ill-informed and ignorant. In a column for the newspaper he wrote: "If I was searching for a top class after-dinner speaker, I would definitely give Alex Salmond a call. "But the man to help steer newspapers through their most turbulent times for 200 years? Perhaps not. "Mr Salmond retorted that Mr O'Donnell was the first Scotsman editor in 35 years that he had not met. "But I would probably say, if you can run a country, as I have, then you can probably run a company. "Sky News first reported earlier this month on the boardroom battle for control of Johnston Press.It declined to comment at the time on Mr Ager-Hanssen's demands.A source close to the media company pointed out that all of its board directors received the "firm endorsement of shareholders at May's annual meeting, with over 99% of the vote".This week, Johnston Press acknowledged a request for a shareholder vote from Mr Ager-Hanssen's Custos GroupIt said: "The Johnston Press Board is consulting with its advisers and will update its shareholders with regard to the timing of the General Meeting in due course. "Shareholders are advised to take no action at this time. Further announcements will be made as appropriate. "Johnston Press did not comment on the latest remarks from Mr Salmond.